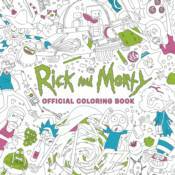 Nobody belongs anywhere, nobody exists on purpose, everybody's going to die� come do some coloring. Burrrp, we've got all your favorites: Krombopulos Michael, meeseeks, plumbuses and more. Prepare for intricate adult coloring patterns and high-concept sci-fi rigmarole in the best coloring book in dimension C-137! Peace among worlds Rick and Morty fans� peace among worlds.